At least three people died and 22 people were injured in a blast in a central Bangkok shopping district on Sunday, the day after gunmen attacked an anti-government protest in eastern Thailand, killing two children and wounding dozens of others. Those caught in the Sunday attack were sent to hospitals where three people died. Just hours before the bomb exploded, the pro-government United Front for Democracy against Dictatorship (UDD) – loyal supporters of Thai Prime Minister Yingluck Shinawatra – promised not to prevaricate, but instead deal with anti-government protests paralyzing the capital. "This fight will be harder than any other... You must think how we can deal with Suthep and those supporting him," a UDD leader and senior member of the ruling Puea Thai Party, Jatuporn Prompan, told thousands of supporters in Nakhon Ratchasima, northeast of the capital, Reuters reported. Jatuporn was speaking shortly after gunmen shot at an anti-government protest stage and threw explosives in the Khao Saming district of the eastern province of Trat, killing a five-year-old girl and wounding 41 people late on Saturday. 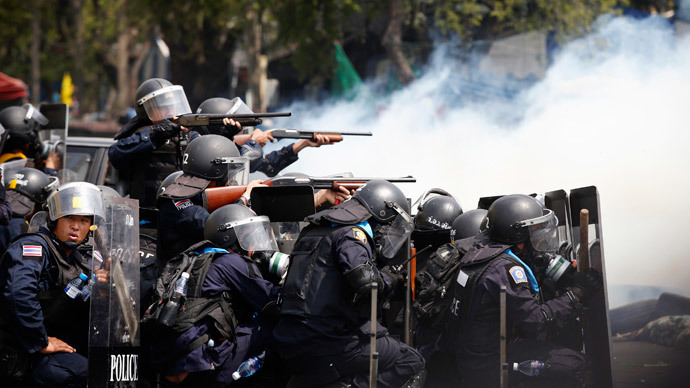 Four protesters and a police officer died on Tuesday when police attempted to reclaim protest sites near government buildings. 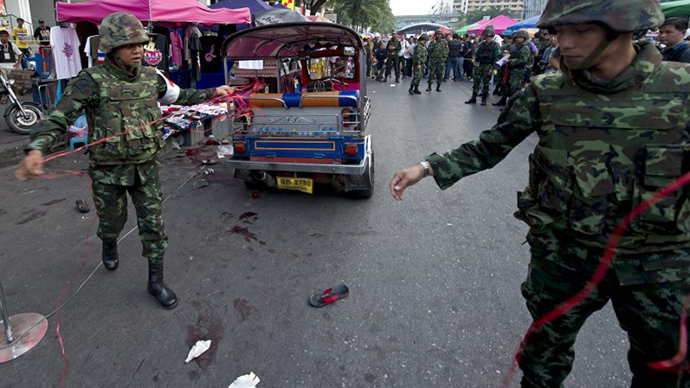 Six people were hurt by a grenade attack on Friday, AP reported. Anti-government protesters have blocked main Bangkok intersections for weeks with tents, tires and sandbags, in an attempt to topple Prime Minister Yingluck Shinawatra. However, rallies have been hit by several gun and grenade attacks by unidentified assailants. Opposition groups are looking to replace the government with the "people's council" to carry out reforms to fight corruption and alleged vote-buying. 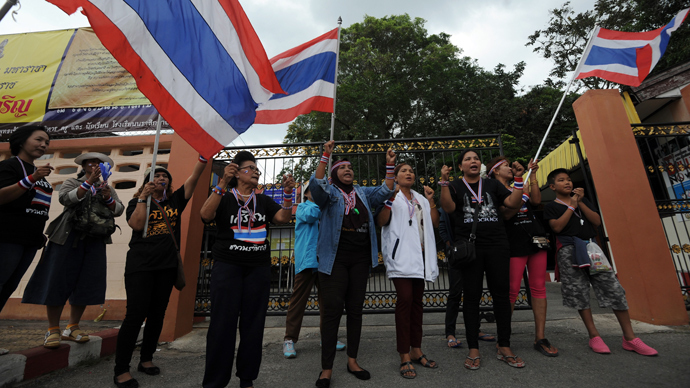 They also want to curtail the influence of the Prime Minister's brother, Thaksin Shinawatra, a former premier and tycoon-turned-politician, ousted in a military coup in September 2006, but seen by many as the real power behind the current regime. The protests are the biggest since the political unrest of 2010, when Thaksin's Red Shirt supporters took over the capital in an attempt to remove a government led by the Democrat Party, now the opposition. 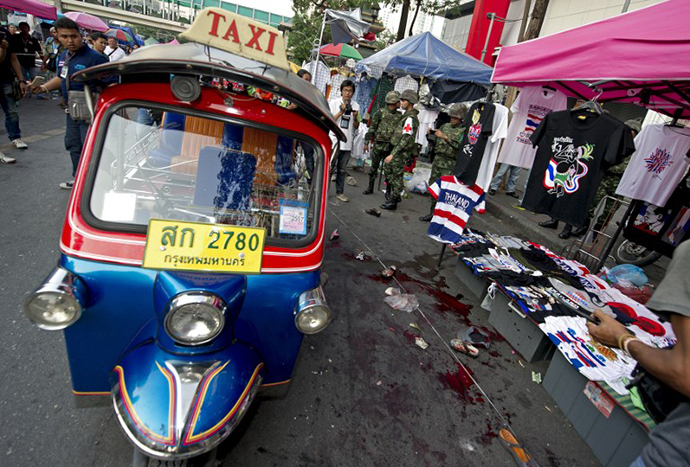 Over 90 people lost their lives in clashes with the police, and 2,000 were injured when Suthep, the then Deputy Prime Minister, sent in troops.